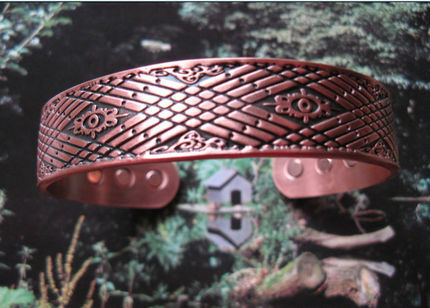 Men's 8 Inch Solid Copper Magnetic Cuff Bracelet CBM853 - 1/2 inch wide. > Men's 8 Inch Solid Copper Magnetic Cuff Bracelet CBM853 - 1/2 inch wide. 6 strong Magnets 3 on each side, each Magnet between 2000-3000 gauss, smooth, antiqued finish. The bracelet is approx. 7 inches from end to end leaving a 1 to 1 1/4 inch gap underneath the wrist, which allows the bracelet to slide on and off easily.